Full length native elastin purified from human skin. In Western Blot, this antibody gave a positive signal in human skin and human lung tissue lysates. Antibody lyophilized from phosphate buffered solution; no BSA and preservative added. Our Abpromise guarantee covers the use of ab23747 in the following tested applications. WB Use a concentration of 1 µg/ml. Detects a band of approximately 70 kDa (predicted molecular weight: 68 kDa). 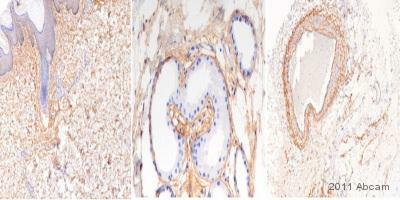 Immunohistochemistry of human skin sections staining Elastin using ab23747 at a 1/500 dilution. 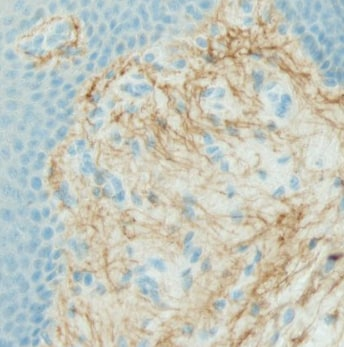 IHC image of ab23747 staining in human skin formalin fixed paraffin embedded tissue section, performed on a Leica BondTM system using the standard protocol F. The section was pre-treated using heat mediated antigen retrieval with sodium citrate buffer (pH6, epitope retrieval solution 1) for 20 mins. The section was then incubated with ab23747 1µg/ml, for 15 mins at room temperature and detected using an HRP conjugated compact polymer system. DAB was used as the chromogen. The section was then counterstained with haematoxylin and mounted with DPX. Publishing research using ab23747? Please let us know so that we can cite the reference in this datasheet. we have a customer that would test your Ab77804 and Ab23747 for a new elisa test which uses a fluorimetric detection system and she would like to know if you can accept this application for submitting an abreview after testing them. If you accept, please do no send me the discount code now, this is just to know if you can accept this proposal because the project of our customer will start next year and I will contact you again once the customer will be ready to purchase the antibodies. Unfortunately, we can only give the discount code for a new application e.g. sandwich ELISA, but not for a new variation of an established application.